As rightly said, “The love of the Family is life’s greatest blessing”. Some people express their l0ve towards their family by saying it, while other represents the same by carving a family tattoo on their body. With the tattoo art carrying importance in the present era, more and more people are getting tattooed with the particular message. 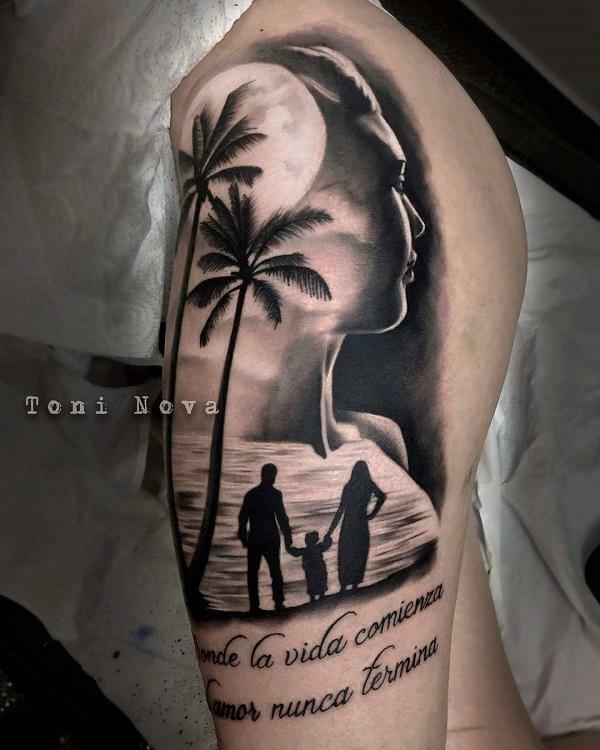 Like other tattoos, the family tattoos also carry a specific significance and mean something different to every person who gets inked with a special family symbol. The family tattoos represent the love, togetherness and forever. 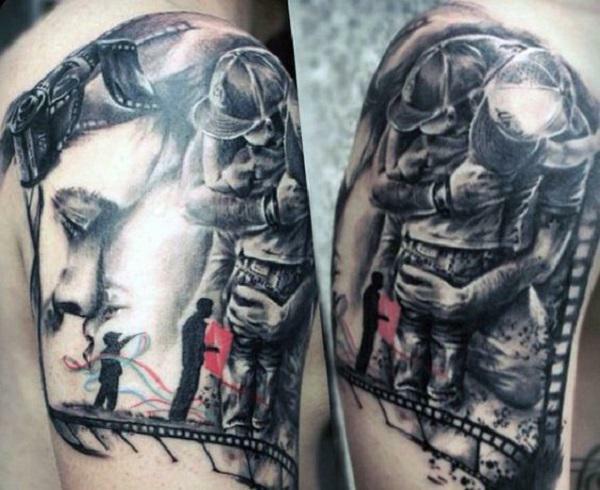 Moreover, the family tattoos also depicts the support during the tough time of one’s life. There is nothing more heart melting than a tattoo that shows your love towards your family and honor towards (a) special person(s) in your life. Family symbols and tattoos are meant to be a quick and easy way to show what your family means to you. 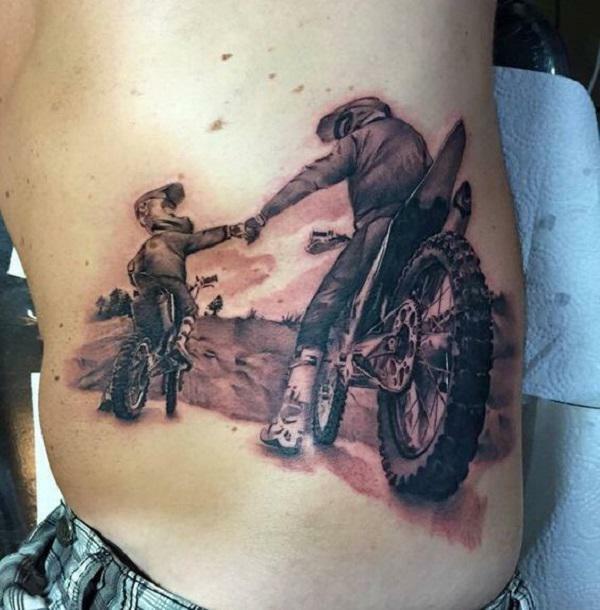 A number of men and women get the family tattoos done on different parts of their bodies. These tattoos are mostly coupled with the family and love quotes along with the symbols that represent the love of the families. 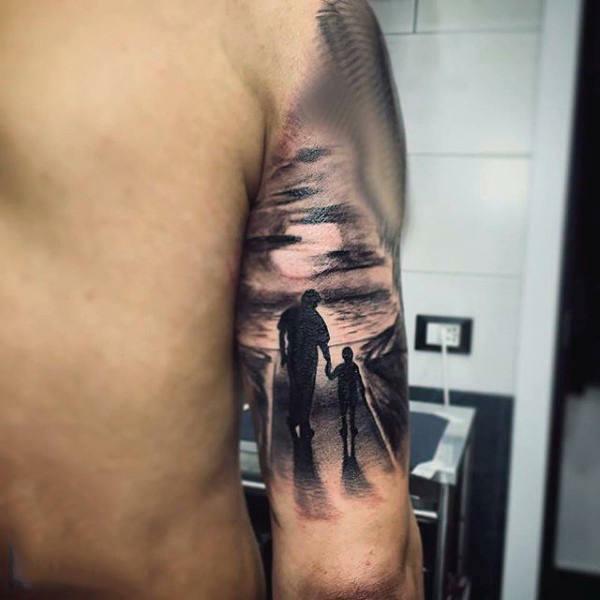 So, if you are looking for a family tattoo with some meaning, you have come to a right place. 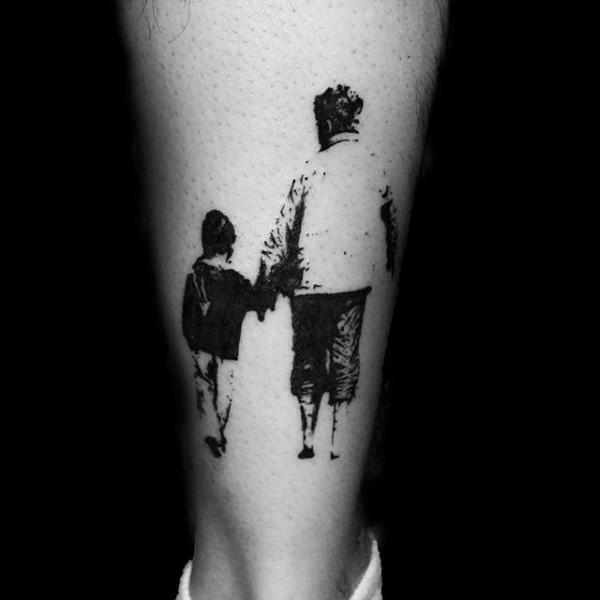 We have rounded some best family tattoos for your inspiration below. Check them out and express your love towards your family. A Family Reel. Starting from the day you met her to the moment when you held your child in your hands, this tattoo is the throwback. You can add your own creativity to this tattoo and your elements to express your infinite love. Heart Filled with Family Love. This is an amazing way to express your love to your family. 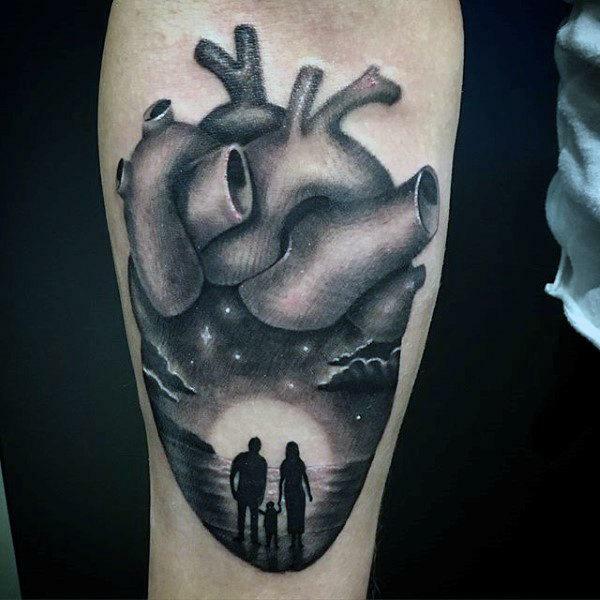 A Beautiful Family Tattoo in a Heart Frame. 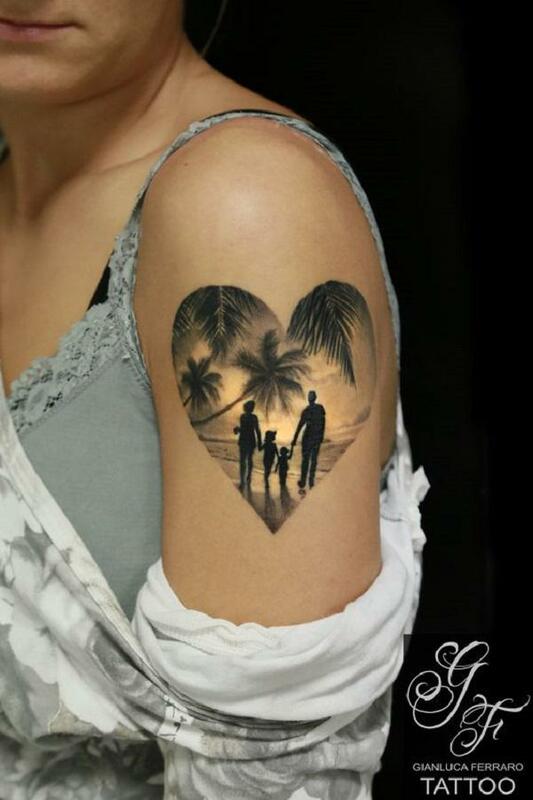 A beautiful family is captured in this tattoo with a heart frame, showing the love and strength forever. Daddy’s Girl. This tattoo is perfect for all the daddy’s girls who want to express their love to their fathers. A Shadowed Family Photo. This adorable family tattoo can be customized by your own creativity and thoughts. “Your First Breath Took Mine Away” Fam Tattoo. As mentioned, family tattoos can be done with the quotes. 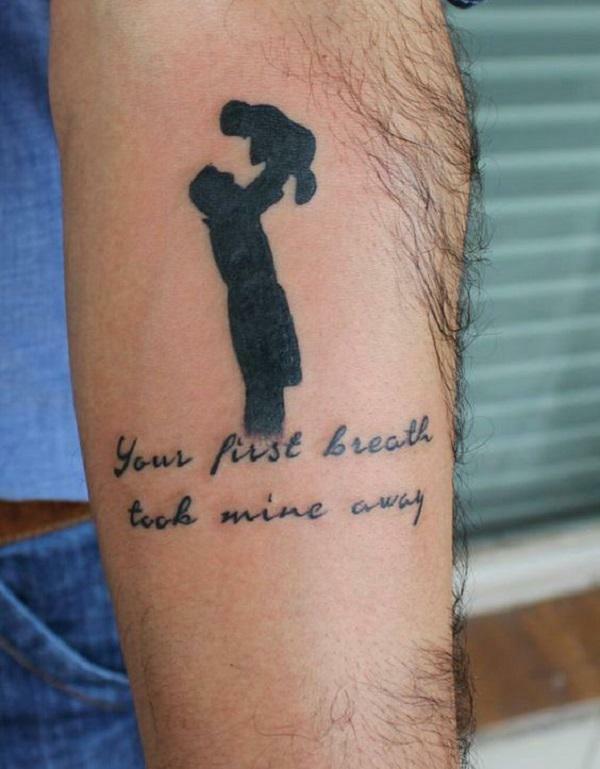 This beautiful tattoo is depicted with the meaningful quote saying, ” Your First Breath Took Mine Away”. 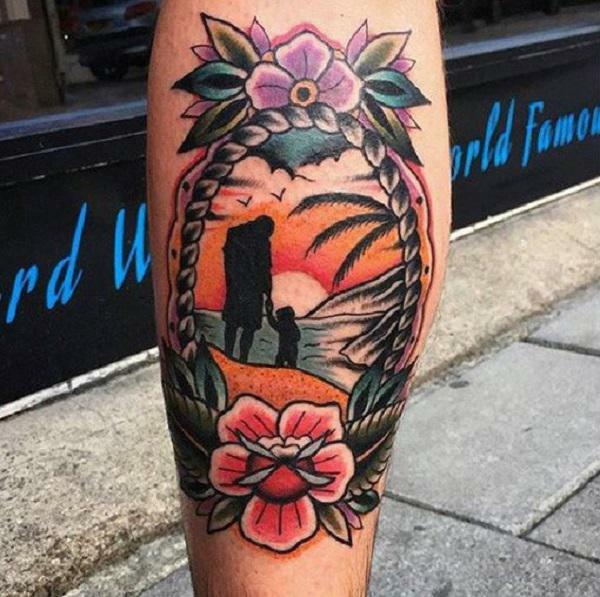 The Sunset Family Tattoo. The birds, the peace, the love and your family. Doesn’t it sound great? 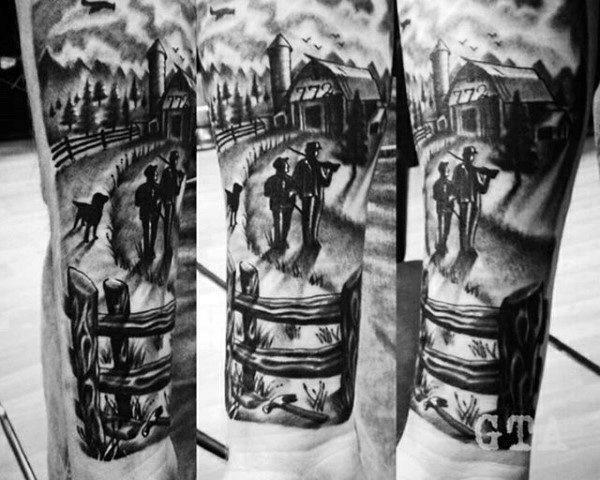 Starring at the sky Family Tattoo. 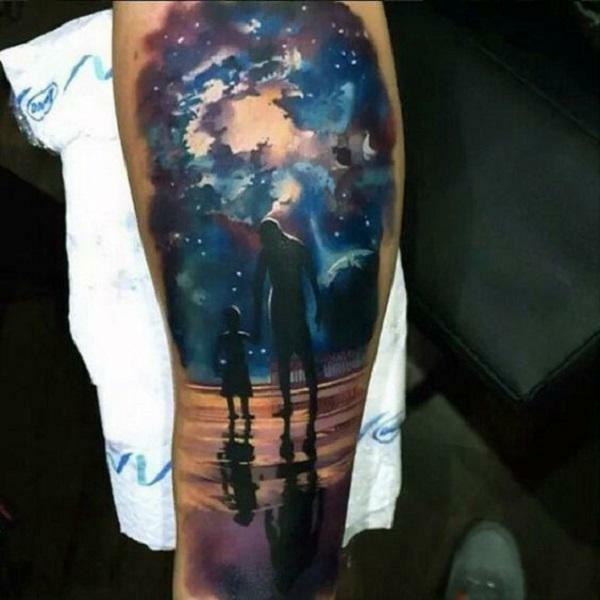 Father holding hand of his daughter showing the sky is beautifully depicted in this tattoo. Dad and Son Family Tattoo. Dad and son walking towards the woods is another great way to show family love. A Family Calendar. This is quite a unique way to express your love towards your family. The dates worth remembering are mentioned in the calendar. Siblings Holding Hands Family Tattoo. This tattoo is dedicated to siblings love. Father and Son Love. 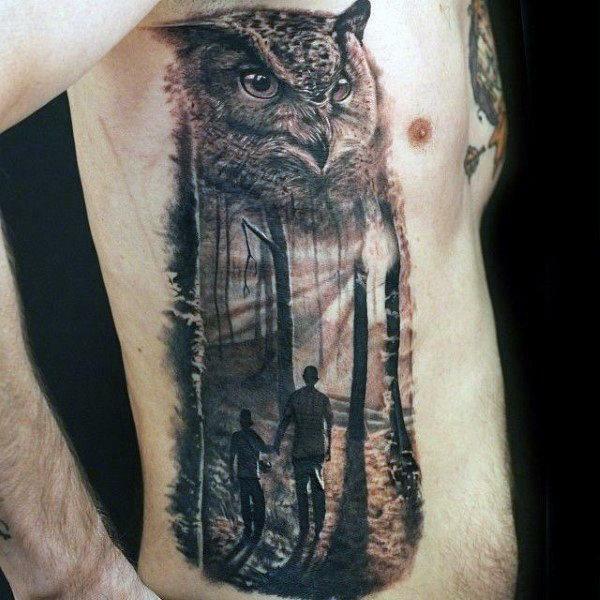 A tattoo that is not only realistic but also personal. Boy Looking Back. 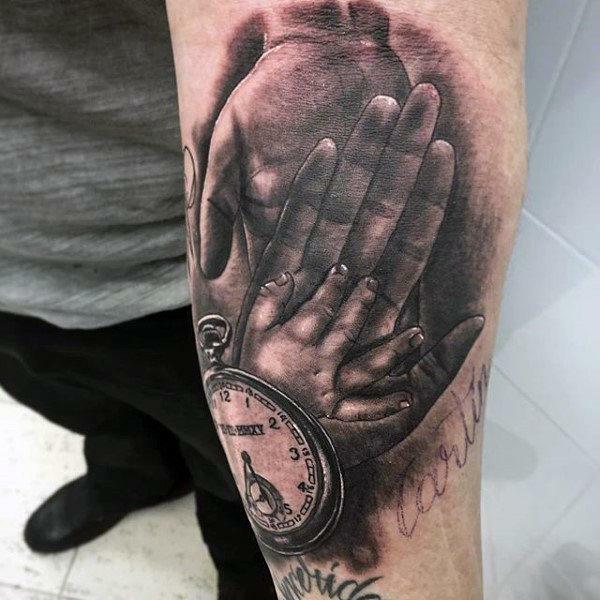 Another great tattoo to dedicate to your family members. This Cute Family Tattoo. 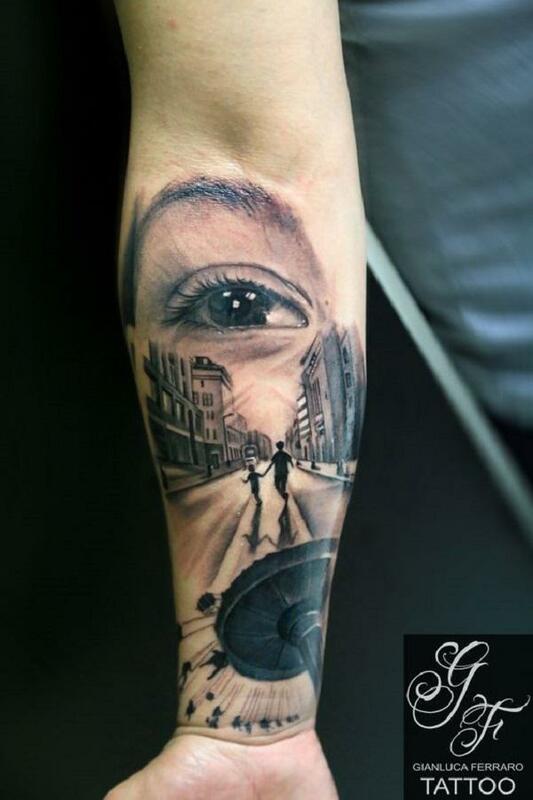 This inner arm tattoo piece is something worth sharing. 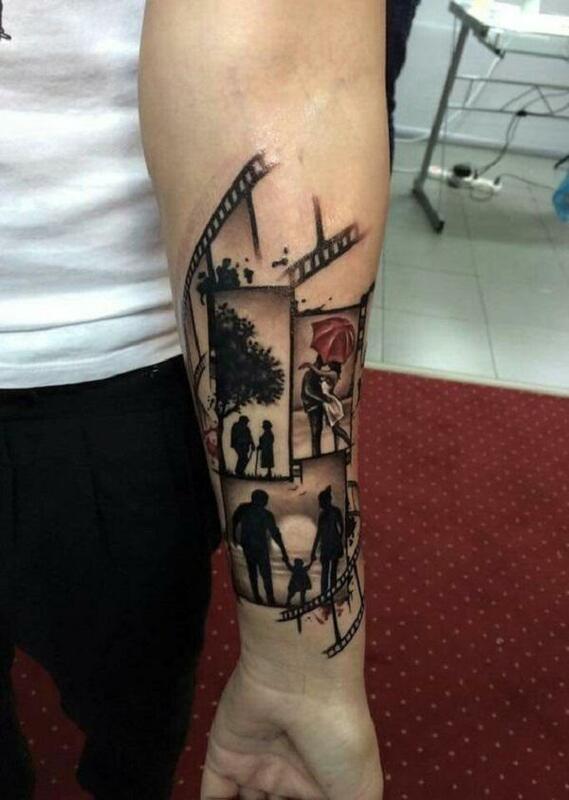 A Complete Family Tattoo. Family is complete when there is a boy and a girl and two loving parents. 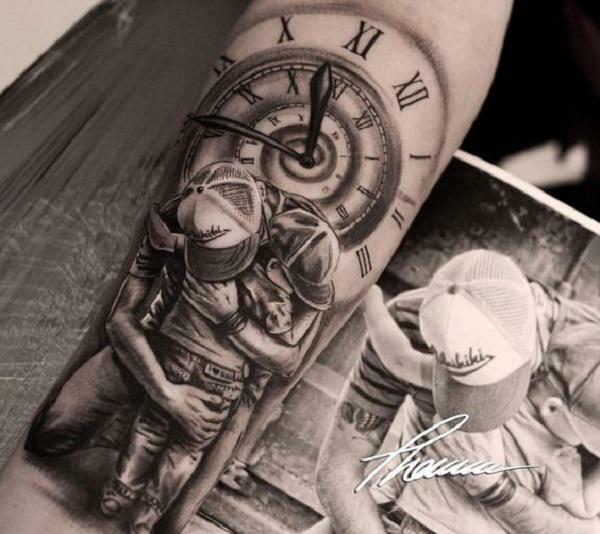 This tattoo piece depicts the same. 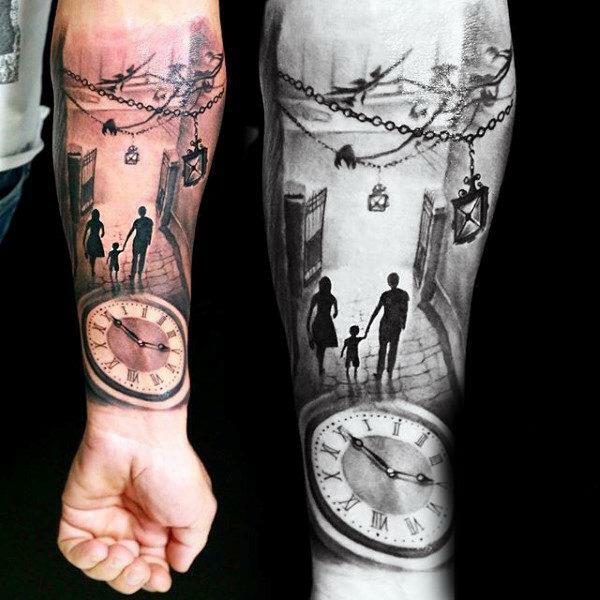 Family Tattoo for Arm. 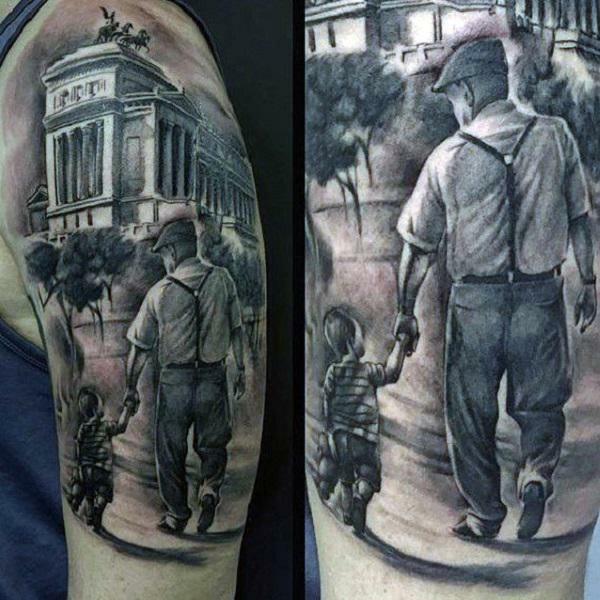 This sleeve tattoo depicts the love and togetherness of a family. No matter what the circumstances might be, family remains together and unbreakable. 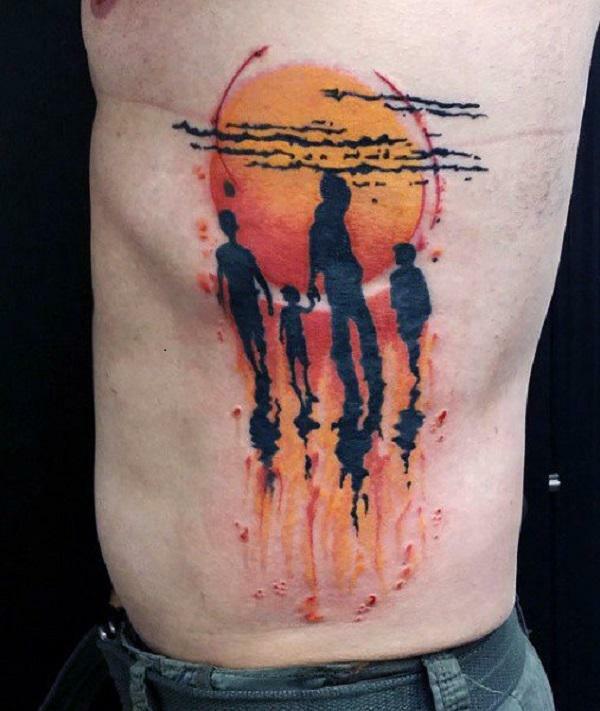 Heartwarming Sunset Family Tattoo. This rib piece is for all those who are looking for a personal place to tattoo their feelings. Ribs are the best place to get personal tattoos. Footprint Family Tattoo. 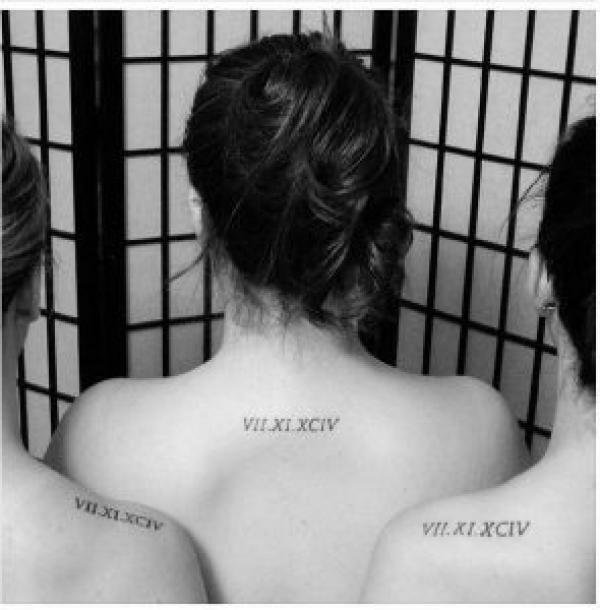 Family tattoos can be dates, names, monograms or whatever that make you think of your family. 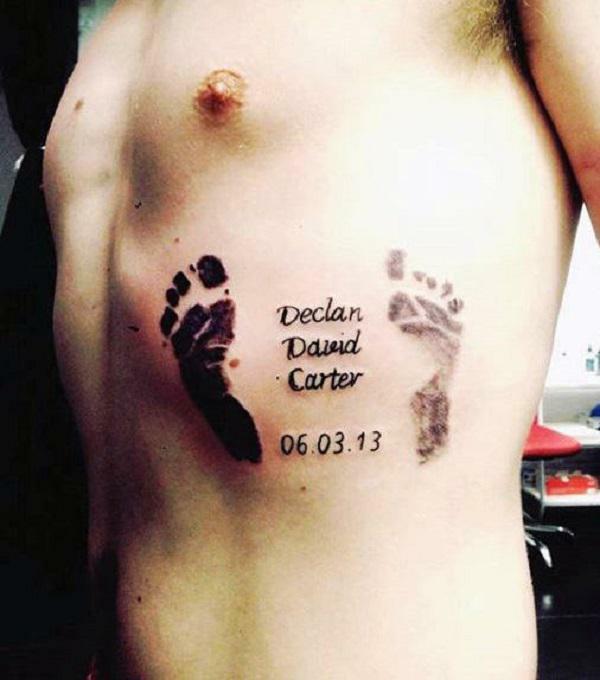 THis tattoo is also a kind that represent date and footprints with the name “Declan David Carter”. A Throwback Mirror. 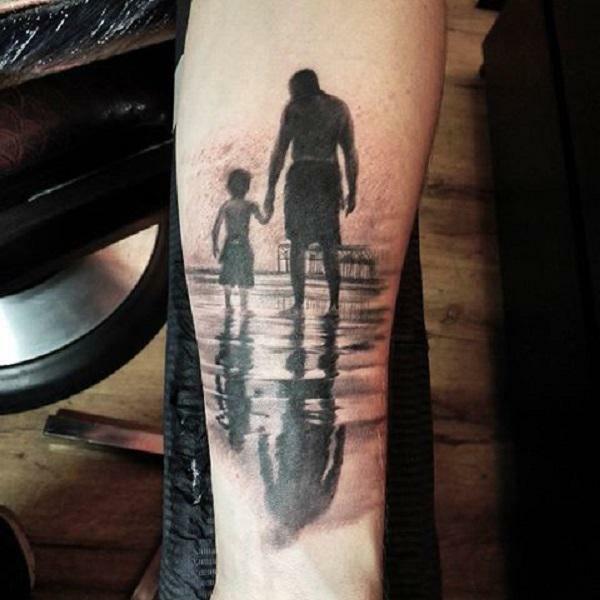 A tattoo can be your throwback mirror of your memories and sweet moments with your family. The tattoo above shows the little memory too. 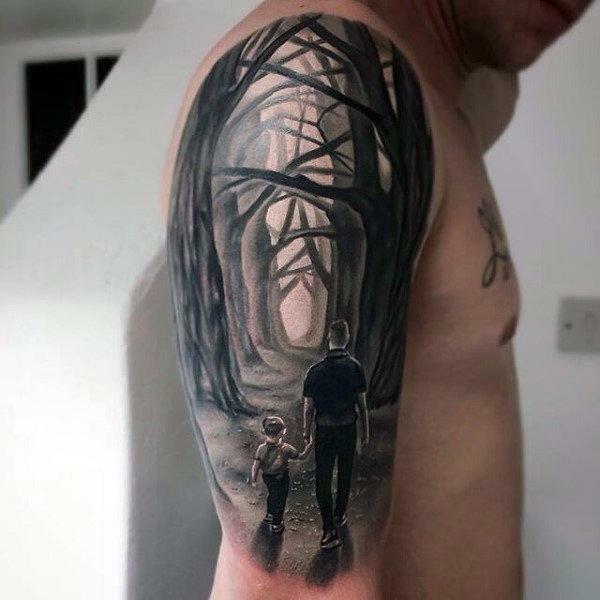 Grey-scaled Family Tattoo. This gray-scaled family tattoo is awesome to get. Realistic yet memorable. 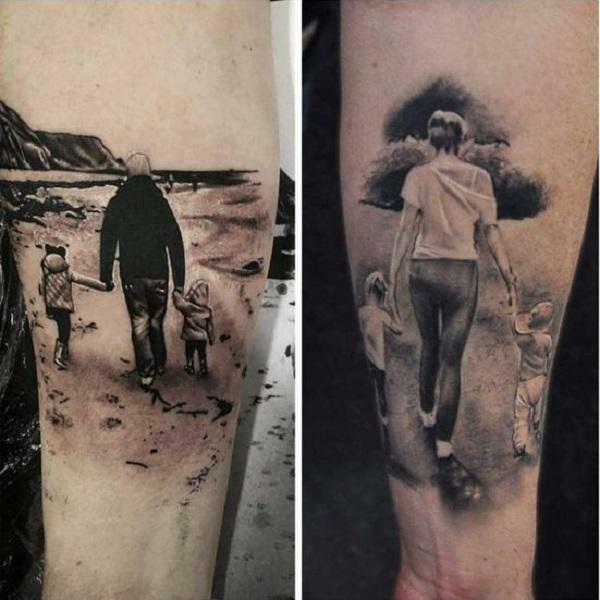 This Sleeve Family Tattoo.. 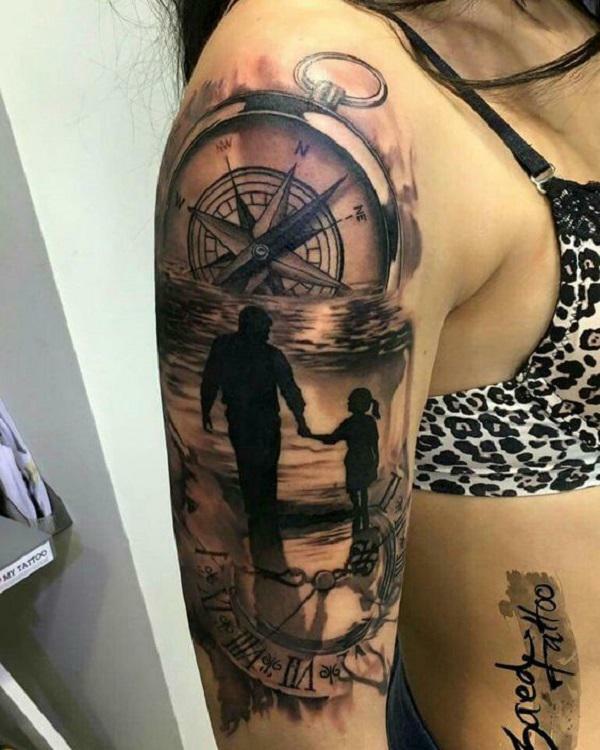 This sleeve family tattoo is incredible to express your affection towards your family. Family Love. This family tattoos worth a thousands meanings. Get this on your arm and be thoughtful. This Detailed Tattoo. 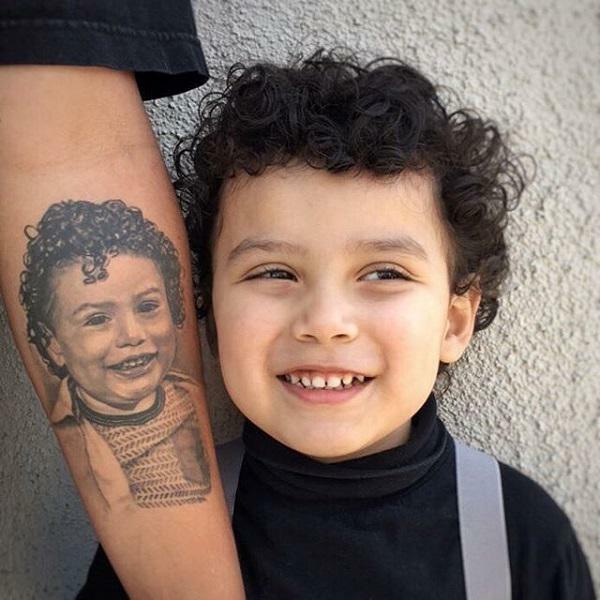 Portrait tattoos are very popular, when it comes to family tattoos. They look great and almost realistic. 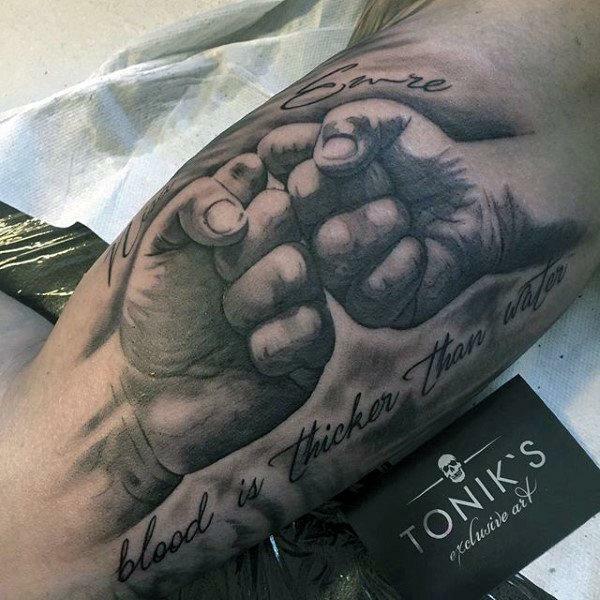 “Blood is Thicker Than Water” Family Tattoo. This tattoo definitely don’t need an explanation. The Shade of Love. Another great yet simple tattoo to share your love and gratitude to your fam. Holding Hands Tattoo. Relive the moment when you first held the hand of your child by getting this adorable holding hand tattoos. A Memorial Sign. 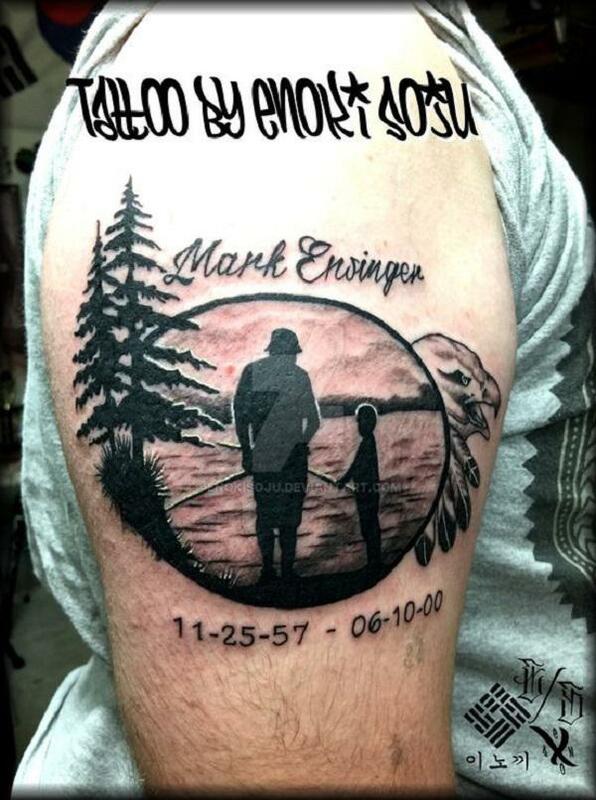 Tattoos can be great to remember someone who has departed. With the name and date, your tattoo can be a memorial sign. “Valeria”. Valeria is actually a Latin girl name meaning “Brave”. This tattoo can be motivational and inspirational. Playing Family Tattoo. A tattoo can be really meaningful. 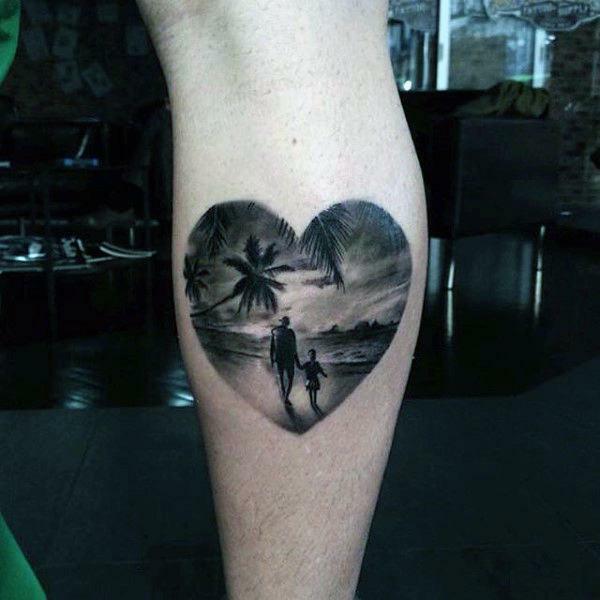 This tattoo reminds of family time together. Son in the Tattoo. 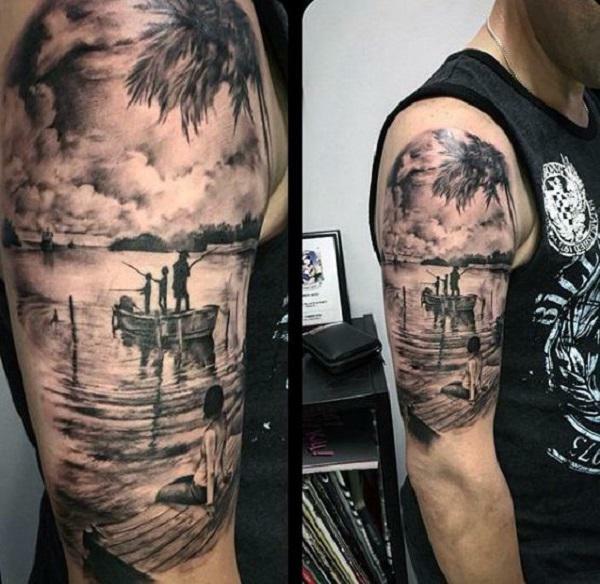 The artist of this tattoo should be saluted. Amazing creativity, alluring skills and much grace. Father- Daughter Love. A girl’s first love is always his father. 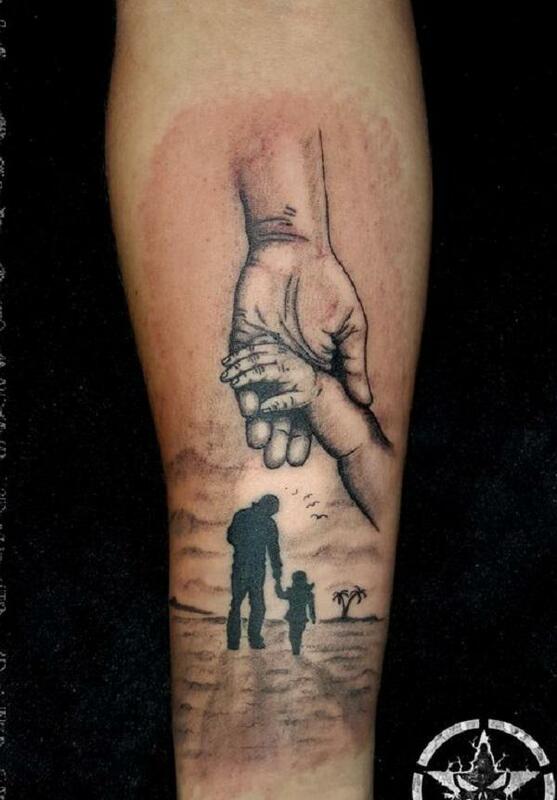 Show your love towards your father by getting this meaningful tattoo. A Lonely Girl Starring At Family. 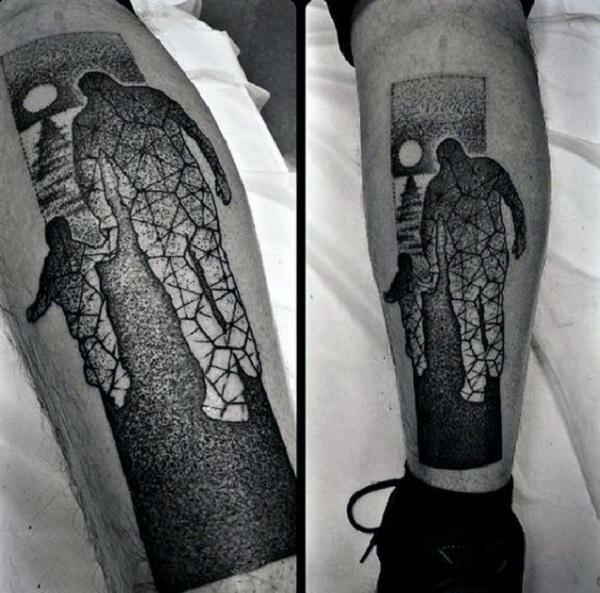 This tattoo is great yet heartbreaking. The lonely girl cherish the family time by sitting and watching a cute family fishing. Family Necklace. This tattoo might remind you of your love story. Lovers exchange these necklaces to show their togetherness and love. If you have also exchanged these lockets with your loved ones, this might be your next art. A Moment for Family. Dedicate a moment to your family who have always stood for you in your hard times. Heartbeat of Colors. This colorful heart filled with family love is great to get. Eagle Eye at Family Moment. You can get this tattoo to get an eagle’s eye to your favorite family moment. A Simple Family Tattoo. If you are looking for something simple yet really meaningful, then this tattoo is right made for you. The Rib Family Piece. Remember the first time when your dad taught to ride a bicycle? Yes? Get that favorite memory of yours tattooed on your ribs. 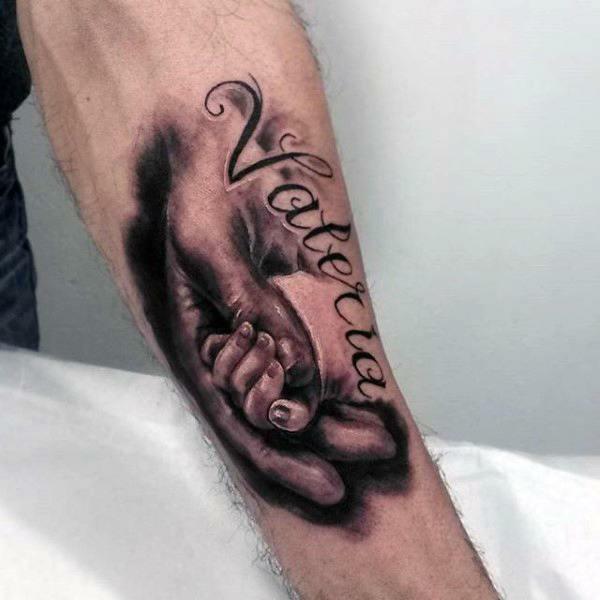 Mother- Baby Love Tattoo. The love of a mother and family never gets old. 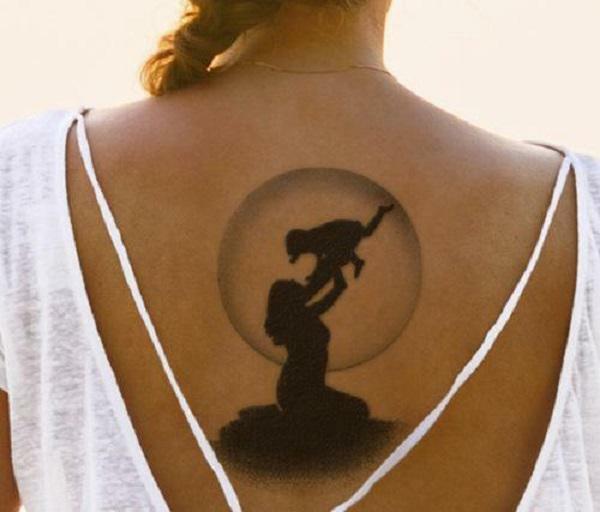 If you love your mom, this tattoo is quite an inspiration. Crossing the Hard Road Family Tattoo. Your family is a great blessing of God that remains there in your hard time. The Family First Tattoo. Get your family first tattoo RN. The Path. A family is where life begins and love never ends. Family At Beach. Beach and family? Do you feel the spark? Get this one for yourself. The Family of Three. Family of three is always the perfect. Your love never divides. This tattoo is a true depiction. Dedicated to Dad. This tattoo is dedicated to the Dad. Quite heart melting. That Hug. The hug from the father can never be replaced. This is something depicted by a tattoo above. Father’s Supporting Hand. Someone said it right, “A Father’s love is eternal”. This love and support is well depicted in this tattoo. Sister Family Tattoos. You and your sister can totally get this tattoo. 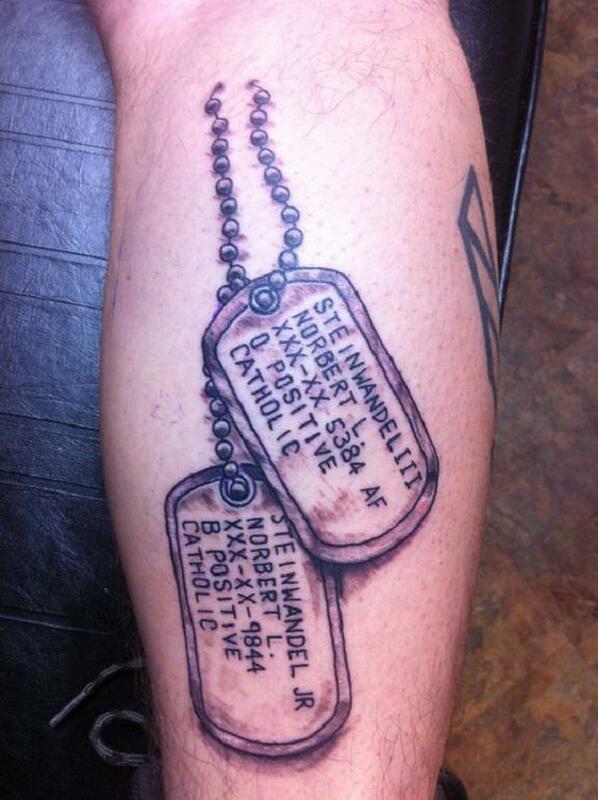 I don’t know the numbers, but this tattoo is something great. The family Maple Leaf. Family love is truly depicted in this maple leaf frame. The Player Boys. A Father is your first teacher. This quote is totally relatable to this tattoo. Right? 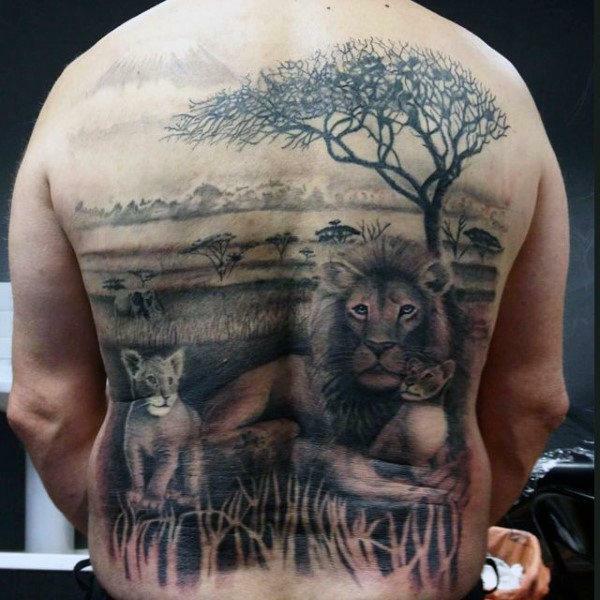 The Lion Family Tattoo. Not only humans, animals does have a family too. This lion family is an evidence of the same. Mother- Child Giggling. Mother and child giggling is the best and melodious voice to hear ever. And their image makes the best tattoo. Beautiful Sunset With Fam. No sunset is beautiful than a sunset with your family! Express your love and affection towards your family with these great family tattoos. 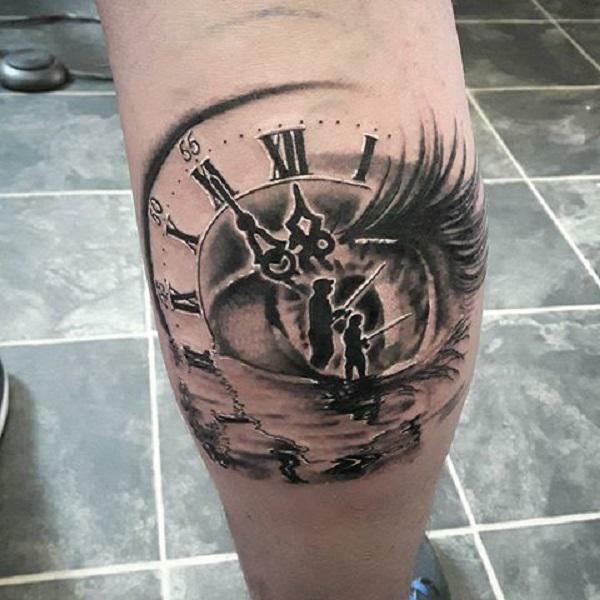 For more tattoo inspiration, you need to keep visiting us!